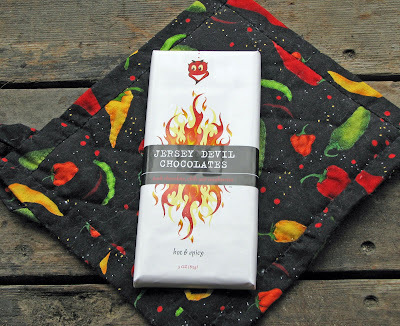 A flying biped with hooves or a dark chocolate bar spiked with chipotle chile studded with tart cranberry bits? Let’s explore the latter. This chocolate bar was named after a creature that was the thirteenth child of a local whore, Mother Leeds. As she gave birth she cried out: “Let it be the Devil”. Enough of this tall tale and lets taste some chocolate from New Jersey. This chocolate bar has 54 percent cacao content. The cranberries are locally sourced from New Jersey. (Did you know New Jersey is the third largest cranberry producer in the United States?). Dark chocolate goodness with little crunches of tart cranberry is your first taste impression. All of a sudden a little warmth of chile pepper will be knocking at your taste buds door. Chipotle chile is a smoked jalapeno pepper. This pepper has a lot of flavor profiles; smoke, fruit, chocolate, coffee, jalapeno and can be hot as the devil. In this candy bar there is a light hand with the chipotle. 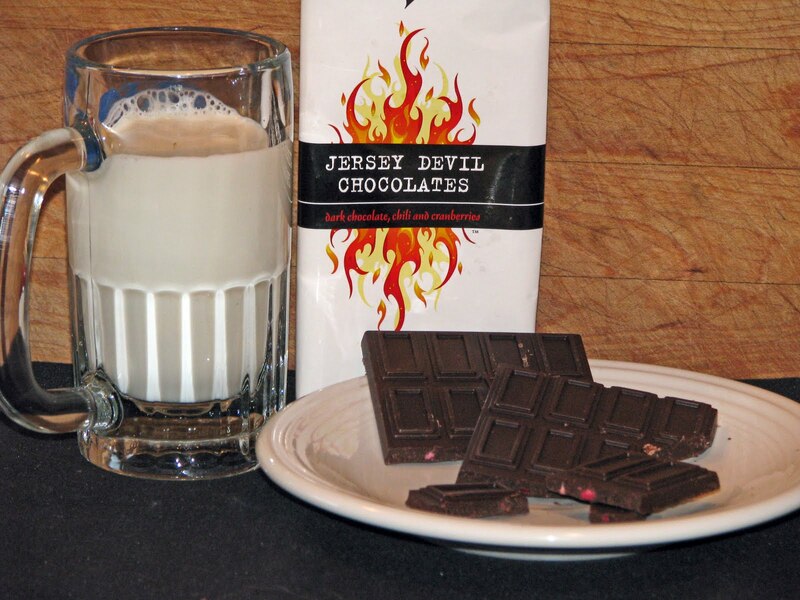 You will only experience a little warmth that lets you know that this candy bar is devilishly good. This candy bar hits on all cylinders. Sweet, tart and heat combine for a lovely chocolate treat. ‘Jersey Devil Chocolates’ is a candy bar I wish I could get in my ‘trick or treat’ bag! Are you going to be a bunny rabbit for Halloween again this year? cookiecrumb, What candy will you be giving out? Greg, Yes they do talk funny on that side of the world. They do make some great chocolate. PresidentofCookies, Absolutely not. Never have, never will. 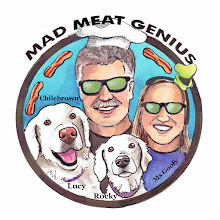 I will be the Mad Meat Genius! Zoomie, I would if I had any left. Starburst and KitKats. Something we wouldn't mind nibbling on if we only get a few kids at the door.